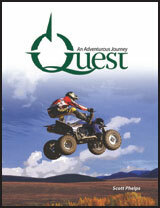 Quest, the abstinence curriculum for 8th graders, uses true stories to help students along life’s journey. Practical instruction helps students identify their future goals, such as marriage and family, and avoid obstacles such as sexual activity and other risk behaviors that could keep them from achieving their goals. Teacher’s Guide includes notes, classroom activities, and Resource CD with Power Point.